Ah, the month of watercress, purple sprouting broccoli, lettuce, spinach and prawns. 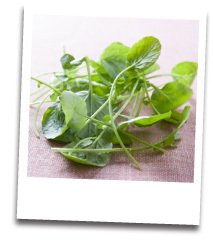 And watercress has been described as a powerhouse vegetable. This is a recipe originally inspired by James Martin. You can ask the fishmonger to fillet the sole for you. Wash the fish and pat dry. Preheat the oven to 200°C/400°F Sprinkle the flour onto a plate and season with salt and freshly ground black pepper. Dust the fish in the flour on each side. Heat a non-stick ovenproof frying pan on a high heat and pour in the vegetable oil. Place the fish in the pan, white skin-side down, and fry for 2-3 minutes, or until pale golden-brown. Turn the fish over using a palette knife. Add a knob of butter and place in the oven to cook for 6-7 minutes. Peel the lemon, remove the pith by gently scraping with a knife (try not to pierce the flesh of the lemon) and slice into rounds/lemon flowers. Heat a frying pan until hot, add the butter and shallot and fry for 2-3 minutes. Add the mace, cayenne pepper and Gentlemen’s relish or anchovy paste and stir to combine, then add the crab meat and chopped watercress. Remove the pan from the heat and keep warm. Season with salt and freshly ground black pepper and a squeeze of lemon juice. Place the sole in the centre of a large serving plate. Spoon over the watercress butter and top with two to three slices of lemon flowers and garnish with the remaining watercress leaves and serve.